Stefan Selig, Under Secretary for the International Trade Administration. This post contains external links. Please review our external linking policy. Last week, I was in New York City to launch the United States-Africa Institutional Investor Roadshow, an important move towards strengthening the United States’ commercial engagement with Africa. I felt honored to join Prime Minister Hailemariam, Prime Minister Jugnauth and President Kenyatta, not to mention the dozens of delegation members representing Ethiopia, Kenya, Mauritius, Mozambique, Rwanda, Cote d’ Ivoire and the African Union. The presence and participation of these delegations was absolutely critical to the success of this inaugural roadshow. It is no secret that the United States and the nations of Africa are mutual stakeholders in each other’s commercial success. But there is an enormous amount of untapped potential in our commercial engagement with Africa. It is the second fastest growing region in the world today. Some of the world’s fastest growing economies are in sub-Saharan Africa. And this part of the world will feature a middle class of one billion people within the next 25 years, and a quarter of the global workforce in a generation. But despite this, only 0.01% of the roughly $79 trillion in assets managed by institutional investors in OECD countries (Organisation for Economic Co-operation and Development) are allocated to investments in Africa. One critical reason is, quite simply, a lack of good information according to the President’s Advisory Council on Doing Business in Africa (PAC-DBIA) ,which is charged with advising the President through Secretary Pritzker on strengthening U.S.-Africa commercial engagement. A recent PAC-DBIA report stated that many of the challenges to investment and expanding access to credit in sub-Saharan Africa related to “misperceptions of risk and knowledge gaps of the Africa market opportunities” and “identifying and mitigating actual market risks.” So a critical force that is needed to attract capital to opportunity and to attract opportunity to capital is precisely what has been missing so far: good information. Having worked in the private sector for nearly 30 years, I keenly understand that for our businesses to maximize investment opportunities abroad, our information must be transparent, widely accessible and instill trust and confidence in the African market. This roadshow represents a platform to bridge this information gap. 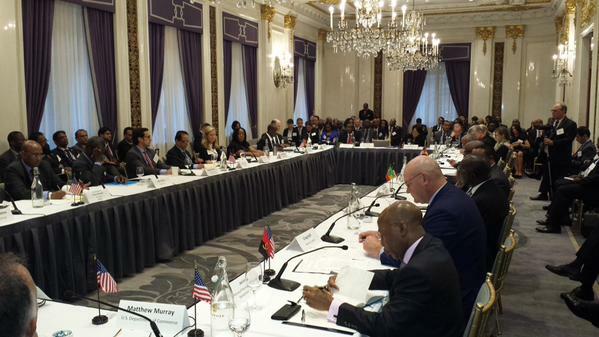 During my visit, I was able to take part in several roundtable discussions with the American business community and African leaders on topics such as investor risk concerns. These types of discussions deepen our U.S.-Africa commercial partnerships on the basis of trust and shared values. As this launch event leads to a series of high-level stops throughout Africa in the future, we will continue our efforts to bridge the information gap to spur new trade and investment opportunities. And In the long-term, this roadshow will forge a partnership between the U.S. and African public and private sectors, bringing together capital and opportunity. I am thrilled that we are one step closer to our long term goal of creating investment climates that attract capital.